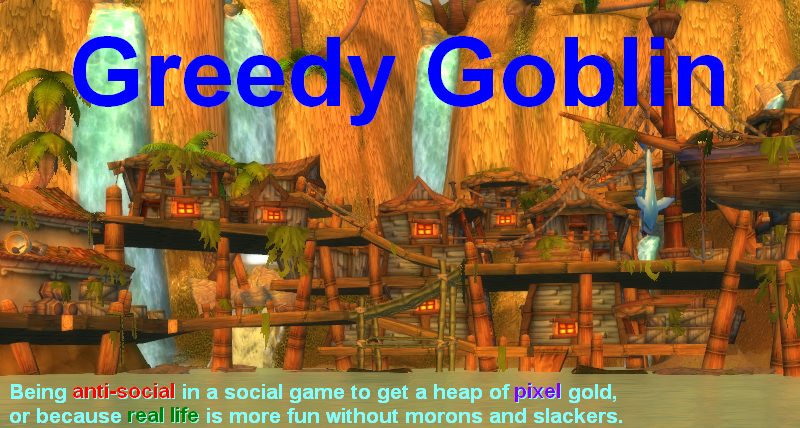 Greedy goblin: There is no "respect number"
There is no "respect number"
Respect is often mentioned goal of “real PvP”. That getting a “gf” after a battle is a reward itself. Jester wrote in his PvP guide “success is rewarded with prestige, the pressing forward of larger organizational goals, financial rewards, or all three.” Since roaming PvP has no financial aspect (the loss is trivial to even an impoverished noob) and it’s not part of a campaign (not to mention that campaigns are officially to get fights as they didn’t want that region anyway), nothing but prestige left. But there is a fundamental problem here: there is no accepted respect number. No, I’m not making the obvious point that respect is not a scientifically observable quantity like ship kill value. My point that in real life, all kind of activities that draw public respect has some form of signaling and acknowledgement system. While “bravery” and “loyalty” cannot be measured scientifically, you can get official medals in every army if you perform actions which are considered “above and beyond”. Untrue claims to be a decorated war hero is punishable crime in several countries. The “artistic value” of a piece of artwork cannot be measured by scientific methods either. Yet there are both prizes to be earned, judged by experts and there are sites like Metacritic that collects various opinions from experts and averages this value. Ironically, scientific value cannot be measured scientifically. You can’t say that Newton did 150 points of progression while Kepler did 62. Yet there is impact factor, counting citations (number of times other scientists found that the article was contributing to their own work) and from there, a number can be gained to measure the scientific value of a work or even the researcher. In all cases subjective opinion of experts was formalized, netting an objectively existing medal or score that serves as a proof of merit towards the uneducated public, ending all debate. While you can argue if Joe is brave or not as that's opinionated, there is no argument over the fact that Joe got a Silver Star and a Purple Heart, proving that he was wounded in combat and his military superiors believed that he did so while performing exceptionally. Such “PvP score” or badge could exist in the EVE community, working semi-automatically, scanning killboards for hard kills and then validating them manually. It could also work using a voting system, averaging scores given by multiple experts. Yet not even failed attempts were made to create any kind of such system. Why? Because of favoritism and the terribly easy way to cheat. Experts in the above examples were all on the same sides: members of the same army, fellow scientists, art critics. On the other hand EVE PvP-ers often belong to small groups and there is actually no group in EVE which is widely acclaimed. This is unseparable from the fact that vast majority of PvP losers refuse to accept a superior skilled opponent, claiming “outshipping”, “blobbing” or lag as reason for their defeat. Therefore the same action which is called “awesome skills” by blues of the killer, is called “gank” by everyone else. Secondly and more importantly – unlike military heroism, art and scientific work – outstanding PvP performance can be easily cheated. Here is a solo carrier kill receiving 3200 points from zkillboard.com, due to its near impossibility, proving extraordinary skills – while in truth I simply bought this carrier from its manufacturer. I could create a titan kill report with a solo noobship if I wanted to. Because of these reasons, “earning respect” is not simply a bad goal, but an impossible one. No matter what kind of PvP action I’d waste my time with, I would not gain an inch of respect from the public, due to lack of experts, scores and medals. There would always be a way to explain why my results doesn't count (ganking, in a blob, lucky, whatever). This of course true for everyone else. Even if you receive a “gf” from a random guy you’ll never see again, you can’t reasonably expect anyone else to respect you for it. You can spend years killing random ships without anyone taking notice or giving a damn if reminded. True. But if you take a frigate and kill an enemy frigate, that is still more worthy of respect than ganking a mining barge. Who cares if it shows up on a killboard or not? Your point about faking kills could count for any kills. All of your ganking kills could have been barges you paid for. Your goal in starting your ganking mission was to change how people played the game, but did you ever have any accurate demographic numbers during that whole time? Briefly seeing someone you'll never meet again mining in a skiff instead of a hulk doesn't count. How can you possibly know if you had succeeded or failed when there's no medal for "most number of minds changed"? It's true that there isn't any built in metric as it's impossible to create one. Yet most people can recognize value from non-value. Of course there could be cheating, but what would be the point? You would only cheat yourself and loose in a real fight. You would only be a showoff without any real skill. What goal would that accomplish? In eve, pvpers don't usually fight for glory, but to either achieve some objective or simply satisfaction. Cheating is not achieving that goal but making it look like. It also is nothing to be satisfied about, since it was bypassing the obstacle, not overcoming it. Pvp is a reward for itself. @Anonymous: Considering that there is no respect number, "more respect" has no meaning. It would be quite expensive to pay for 136B kills, especially for pods as they can't be insured. @Second anonymous: the plan was to get enough gankers to cover the whole highsec and simply reach a state where no Macks, Hulks and Covs can be seen, which is undoubtably a change. Gevlon just go back to wow and start arena (if you manage to find somebody as awesome as you to play with). There you will get your respect, with gladiator title. Oh wait then you will be whining about broken balance. At war you don't get medals for killing 50 pple, pple get awarded because "experts" decided to give them those medals. And other side of conflict won't like it. Same in eve, you will never gain full respect in pvp because there always be pple that you've killed and they won't like it. But still if you are good you can earn respect from your fellow corpo capsuleer friends. Not everything can be quantified in terms of a number. Anyone respected in _any_ field doesn't have a score associated with them, yet they are still respected for their deeds. You can keep banging on about measurable goals and what have you but it doesn't make your assertions any more correct. You can measure results though. In wow when we got upto 1.3,1.4,1.5k rating in rbgs that was measurable. You could go get measurable "real pvp" success, if you were going out and getting a postive killboard without cheating. It more then possible to do and well within your capabilties to do it. I dont believe its in your interest to do it though as lets be honest, you dont care what the random player thinks. Leads me back to my suggestion to you two days ago that probably got lost at the bottom of the comments pile: Go learn to FC with eve uni and do some runs. Your a decent leader, we all know people will follow you, because you usually get results and entertain us before you pull the plug on your projects. Eve uni would be the perfect place to develop your skill set in leading and after a few successful roams where you spill "the bucket of baby rottweillers" over some unspecting low seccers, we could all stop reading about how you should "stfu ganking aint pvp derp". Firstly, there are medals in EVE. Secondly, not everything has to be boiled down to a measurable metric. We all know what constitudes a good PvPer. We've tried to explain it but you simply don;t get or it or refuse to accept it. That's your problem buddy. You can keep telling us how you think the system is wrong and how there should be measures in place so you can prove yourself without effort, but that's not how it works. You will never gain the respect of the majority of the playerbase, measurable or not, through shooting miners. If you don;t want that respect, great! But stop trying to convince people that the way we interpret things is wrong, just because it puts you at the bottom. See the underlying problem in all of this is that you want to make a difference, but you don't want to put the graft in, so you want to find an easy way to beat a metric, then you want to try to make us all agree that metric is what matters. All you are doing though is wasting your time. What you don't seem to realize is that a medal is usually given to you by someone who's respect you earned, and is only of value if it comes from someone widely respected. Handing out medals automatically would devalue them, make them like achievements (like available in some games) and by that worthless. These people who say "that isn't real pvp" are simply committing the logical fallacy No True Scotsman. We've seen this argument repeatedly from previous commenters, on many topics. It's just another thing that people do when they are being stubborn. Maybe your new goal should be in the advancement in EvE theory, measuring your impact factor from the number of references you get in EvE related media? Of course, do to lack of peer review in publications, and understanding of people that aren't you on your side this would be a moronic experience as the idiot that gets his friends to shout loudest would win. @Lucas: my point is that no matter what I do or you do, we will never get the respect of the majority of the playerbase. If the majority of the playerbase could agree in "X is respectable", there would already be a measurement system. The truth is that the EVE community is very fragmented and NOTHING gets wide respect. While practically everyone agree that ganking miners is not respectable PvP, their agreement ends here. I mean Joe, Jack and Jane all say that I'm a loser ganker. However Joe, Jack and me agree that Jane is a no skill F1-monkey. Joe, Jane and me agree that Jack is just a gatecamping punk who pops frigs in his remote seboed Tornado. Jack, Jane and me agree that Joe is just a ganker hunting nullsec ratting bots after they start to ignore his afk-cloaking tackle alt. So the only thing Joe, Jack, Jane and me can agree is that everyone else is a no-skill punk therefore practically no one deserves any respect. Aren't Alliance Tournament medals the kind of respect number you are looking for? Except Chriba - he gets universal respect. And the Mittani - He has the respect of enough people to be allowed to remain in command of the most influential and feared alliance in the game.. I could go on. But I only needed one to break down your ridiculous assertion that "NOTHING" gets respected in the game. Yes, alliance tournament badge would be a signal of PvP skills. But does it mean that anyone without it are equal noobs? @Nightgerbil: herding dumb cats, telling them when to jump and when to breath isn't my dream job. The best way to get true respect is to champion a cause(s) in game that best reflects your true interest(s). Even if that starts with what you are currently good at. Be it as an investment broker, perhaps as THE broker of New Eden, people receive a profit from your company (corp) and your % take is then used to fund X,Y and Z project. I'm being selfish in saying that as I could use mountains of isk. But you have a great understanding of eve's isk flow, use it by doing things that make people say your name with respect. Thats just by two cents, I hope you can use it. Knowledge, Diplomacy, Tact...these are not measurable metrics.. The guy who knows most about economics is not necessarily the guy who gets asked for advice. The Dalai Lama does not have measurable metrics, but, he seems to pop into any door he wants. Again, this comes down to you wanting fame and acknowledgement. Chribba is an out of game developer, sure...but if you think his ingame respect is because he does OOG stuff then you are mistaken. Chribba is respected because he is a universal nice guy and trusted. The measurable metric is "He hasnt run off with our isk during transactions"..but here, he is one of several third parties. The Mittani was not banned for any ingame behaviour, rather for being a drunk idiot..you are using "People must be above reproach in positions of authority" argument. Kil2...the commenter was saying about players respecting him, not CCP. There are devs people do not agree with, or respect their knowledge of the game, Kil2 is not one of those. You'll never be satisfied with Eve because you value results and metrics over process. The key is to enjoy the activity as it's unfolding, not simply put up with it for the sake of a result. To do that would be like listening to a symphony not for its beauty phrase by phrase, but for the final note - and then to blog about it. in real life, all kind of activities that draw public respect has some form of signaling and acknowledgement system. there is actually no group in EVE which is widely acclaimed. Nonsense. Tournament winners are. But there are many others. Goons, for example. Noir. In wspace, SYJ. These examples off the top of my head, from a guy who's been playing a year and a half. I am sure there are many other highly respected PVP groups I don't know about. But you know, that's the thing. I am not so arrogant (and idiotic) to believe that I know everything about what everyone in EVE thinks. Just because you don't know about respected PVPers does not mean they don't exist. outstanding PvP performance can be easily cheated. You mean an algorithm can be cheated. This is true. (How easy it is, I might quibble. As someone pointed out: maybe you cheated those gank kills you are so proud of.) But, again, show me the team that has cheated a win of a major EVE tournament. Extraordinary claim, that. See, this is the nice thing about competition. You don't have to be able to objectively measure how strong a competitor is. You just need to be able to determine whether competitor A beat competitor B -- and this is what the competition is for. So: as I have told you before. If you want an objective goal to work towards, form a team and win a tournament. Does it bother you that there is no solo PVP champion in EVE? Well, get off your rear end and do something. You have plenty of ISK to fund up a tournament. To lay out the rules and attract the best solo PVPers, you'd have to work with other people, true -- probably some respected PVPer. So you'd have to find out who they are. But you can do that. Not only do you have the internet at your fingertips, you have people reading your blog who are good enough at PVP. Aks them. “earning respect” is not simply a bad goal, but an impossible one. Nonsense. All you've shown (besides ignorance of other people's opinions and a certain lack of imagination) is that getting other people to demonstrate respect of your PVP skills is difficult. And this is true. However, the respect of others, while nice, is not the primary motivator for most PVPers: rather it is self-respect. Unless you want to tell us you are incapable of self-respect, this is something you, too, can do. Anyone can. you want respect from others? Are you satisfied with your own performance? and you don't need your mom to tell you did a good job? than why do you want "badges of time wasted"? Von Keigai: I don't know which EVE server you are playing in, but I've never heard a single respectful term about Goons. Not even from Goons. The narrative is "a bunch of morons who solve every problem by throwing 1000000 F1 bashing nerds on it". Self respect is even more a slippery slope. We see retards being fine with their absolutely inacceptable performance. Don't confuse respect with being liked. They are not one in the same. The same Goons that own half of nullsec? People respect the organization even if they hate them. "I don't like the Goons, but you have to respect..." is the common formulation. As for self respect: you do see the "self" in there, right? If you are concerned that retards have it, then don't be a retard. If you are concerned about your own brain slipping down a slippery slope: think different. Stop thinking slippery, like a slacker and moron, and start thinking like a Goblin. Do you think you can do that? Honest self-criticism and self-assessment? I think you can do that. Now that we have gotten clear on the matter of whether you are a retard, perhaps you can return to the idea of self-respect and give a stronger criticism. You might also answer some of the other criticisms I made. Do you think all EVE tournaments are won by cheating? Win a tournament. I guarantee you people will respect you for that. Consider this in the same way an entrepenur, or business project manager would. The metric is defined in the project scope, not everyone has to be perfect in your plan (employees never are) but you set a goal, put down the milestones that show success, and implement. Even is setup as corporations. They are crude, and missing a lot of the things real life has, but it's probably the closest you can get to real world organizations in a game. You kind of hint at it here, there is no fair PVP, just ganker and ganked, in one form or another. So consider the metric of good PVP being the planning stage, and not the implementation. The gank happens because you and your oppoenent have prepared for an engagement, and the one better prepared only has to go through the motions for a victory. I refuse to even ackgnowledge 'thats not fair' argument... Fair is what you make it, things were fair there, the difference was proper planning. You dismiss respect because gaining it is difficult. If you can't beat the best then you are not going to try. There's nothing wrong with that. Beating the best doesn't pay anything either and it would take so much time and effort, and even then you might not accomplish it. Your next option is fear. Some people may have feared your ganking. Ganking miners has been done, so the response was mostly, "He can't kill me often enough, I'm not afraid." Find a new way to be feared. Surprise me. "my point is that no matter what I do or you do, we will never get the respect of the majority of the playerbase. The truth is that the EVE community is very fragmented and NOTHING gets wide respect." But here's the issue. You want a metric that everyone will agree on, but they won't. But that's in everything. A soldier winning medals doesn't automatically mean that nobody is against him. It just means he is more widely respected in that field. The same as a greenpeace activist might be respected by other activists and non-activists, but are also likely to have many people that don't respect them. Sure, you will never get a 100% metric that everyone agrees to, but you don't need to. The thing is respect is nothing more than what other people think about you. So trying to convert it into a measurable metric is absurd. Surely though, you must understand what people mean? You honestly can't be able to write a blog yet dumb enough to not understand that people have varying opinions and some will group people more than others. For example, more people are likely to agree that ganking is a skilless activity, and not a measure of PvP prowess. In the same way more people are likely to agree that you have a good ability to trade than those that disagree. As a trader, you have some respect, as a ganker, you have some respect, as a PvPer, you have none. Where you fall down is that you compare your ganking to PVP, and when you don't get the respect you feel you need, you claim it's due to there not being a measurable metric. That's not the case, there's just no meaningful comparison between what you do and what other PVPers do. No amount of killboard bumping changes the method by which you bumped it. Don't get me wrong though, it's not just you and it's not just gankers. F1 monkeys that rarely do other PVP (like me) are also not respected PvPers. Getting structure and blob kills is just as meaningless a PvP statistic, no matter what isk count is achieved. @Von Keigai: do you know the names of the latest Alliance Tournament winners without looking it up? If not, so much for gaining respect by winning the tournament. There is absolutely no quantitative measure of success, respect, etc. Yet that does not mean that it does not exist; you can't put a number on Newton vs Einstein but that doesn't mean we can all agree they have accomplished more than I. The same would go for Shadoo. Respect and success are social constructs, fought if you will on a social battlefield. Unless you become a cat herder, then I don't see you having any significant impact. "my point is that no matter what I do or you do, we will never get the respect of the majority of the playerbase." So? There are 7 Billion people on earth who give a crap about you or me. Does this mean that we shouldn't try to gain the respect of the few hundred people around us who do give a crap (or could be convinced to give)? Sometimes I wonder if your intentionally setting yourself up for failure. You want to be Someone Important, but you avoid actually doing things which would leave other people speechless even by their own standards. Instead you either dismiss other people as idiots to save you the effort of actually being better, or come up with artificial shortcut metrics nobody else much cares about. The world can't and doesn't run on numbers alone, and you know that - but by stomping your feet and insisting that it has to, you're sabotaging your own efforts. Which reminds me: as a self-acclaimed rational, why do you care about peer respect and acknowledgement anyway? @ everyone. Gevlon is about proving things. That is why he plays. That is "fun" for him. You are wasting your time arguing about things that can't be proven. Proving is winning and vice versa. Respect does not necessarily mean public recognition. Can you name the last six Nobel Prize winners in Physics? You probably have to look it up even though in general you respect the work they put in to receive that award. Fame is not the same as respect. I think one of your problems is that you want respect but have not decided who you want the respect from. For respect to matter you have to acknowledge that the person who gives you respect is someone whose opinion you value. It is clear that you really have not found a person or group in EVE whose opinion you value enough to try and gain their respect. I would also hazard a guess that you personally do not respect what you are currently doing in EVE which is why you are seeking acknowledgement from other sources. You convinced yourself that you are doing the right thing but subconsciously you are questioning the merits of your project and thus seek reinforcement from outside sources. Gevlon, Hydra Reloaded. Pandemic Legion. Verge of Collapse. I do not know the names of the individual pilots, if that is what you are asking. However, I know the names of the teams, and I respect their accomplishment. Since there is no group accomplishment without individual accomplishment, what that really means is that I respect the individuals making up the team as strong PVPers. You don't have to know who someone is to respect his accomplishment. I also don't know who domesticated dogs, or invented the internal combustion engine. But I still respect what they accomplished, whoever they were. If I came to know who it was (as may be possible in the one case), then the respect of the accomplishment would naturally attach to the person. For our purposes, though, I don't need to respect individuals unless you are now backing away from your OP. What you said, and I quote: "there is actually no group in EVE which is widely acclaimed." Group. Hydra Reloaded. Pandemic Legion. Verge of Collapse. Have you heard these names? If you now are willing to admit that there are respected groups in EVE, then you must admit that forming one is a possible goal. Respect is a lot like change in that you can't really set it as a goal. Respect is a byproduct of people feeling they can learn something from you. You can consider it as an indicator of people recognizing your capacity to be the agent of change. So far within Eve your ability to cause changes has been somewhat underwhelming. Not only have you abandoned your core competence - the workings of game economies - you also didn't achieve a whole lot of success on Eve economy front :/. Sure, a few tens billions a month in trading income is an impressive figure, but it's not like you or institutions under your control amounted to any significant part of Eve monthly GDP. @Gevlon: "Chribba is respected for out of game site development"
Once again you prove that either you intentionally forget to mention other important facts, or you simply don't do your research. Remember, not too long ago, how you're were talking about you could never be as trusted as Chribba? Pretty sure that him being honest and trustable is respected. "Yes, alliance tournament badge would be a signal of PvP skills. But does it mean that anyone without it are equal noobs?" Everyone without it can only claim not to be a noob - whether that is true or not nobody can know. Those who want to demonstrate beyond doubt that they are no noobs can work for an AT medal. It's the nature of meaningful medals that they are exclusive and not something you get by default. Firstly, mostly all of the things you've posted here are utterly incorrect. The Mittani's ban for "despicable behavior" is ad hominem and has nothing to do with the argument - he was respected before for in game exploits, and has been respected since for them. Kil2 was respected for "bringing solo back". Fozzie was respected in game for his supreme understanding of the fitting metagame - an understanding that was so good he was tapped on the shoulder to become a developer. But all of is is besides the point. Your point was that people don't get respected for anything in the game. You are moving the goal posts because once again you have been proven incorrect. Quit with the intellectual dishonesty. It is tiresome. you don't know much do you? about respect. Respect is earned it is not measurable in any sense of the word. Take you medal observation, nearly every medal winner will tell you "I don't deserve this, many others did more. I just happened to do my little part where someone important saw me do it". I don't respect micheal jordan for who he is, I do respect what he did in a game I enjoy watching. Respect is a very flimsy term that is applied outward from the individual not the community. You could earn the respect of an entire alliance with a gutsy 'hero tackle' be counted at 'good' at pvp and never get a kill. It is all about how people percive your actions. Same 'hero' tackle but this time you die before help gets there? You might get a 'nice try' and sure you will earn some points but because it happened out of sight it won't count nearly as much. I watched 60 minuets laud an officer saying "and you have been wounded 3 times" in an awe struck voice. The officer laughed and said "I have a trooper who has been wounded 9 times including being shot in the head" yet instead of acknowledging this new information. The reporter continued on stroking the officers resume. Do you get it?